I made a batch of Brown Butter Butterscotch Oatmeal Cookies to take on our flight to Hawaii. It was a six hour flight and I knew cookies would come in handy. You know, to keep the boys happy. Ok, I really made them because I knew I would need cookies to get me through a six hour flight. Traveling is not easy with two kiddos, especially on a long flight. I knew I would need a cookie pick me up! The boys were actually really good on the plane, but that didn’t stop me from breaking into my Brown Butter Butterscotch Oatmeal Cookie stash. They made the flight A LOT better. And don’t worry, I shared with the boys:) They were all smiles when I busted out the cookies. 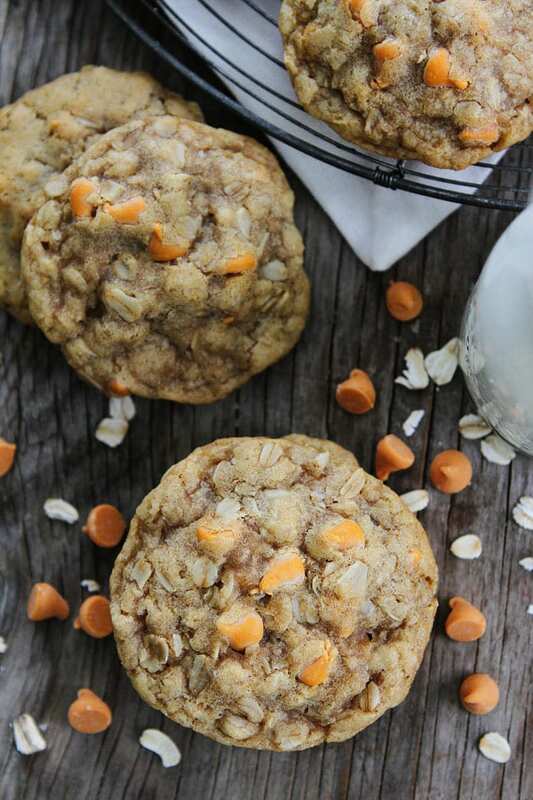 If you like oatmeal scotchies, you will LOVE my Brown Butter Butterscotch Oatmeal Cookies. They are similar to oatmeal scotchies, but WAY better. The brown butter makes them extra special. 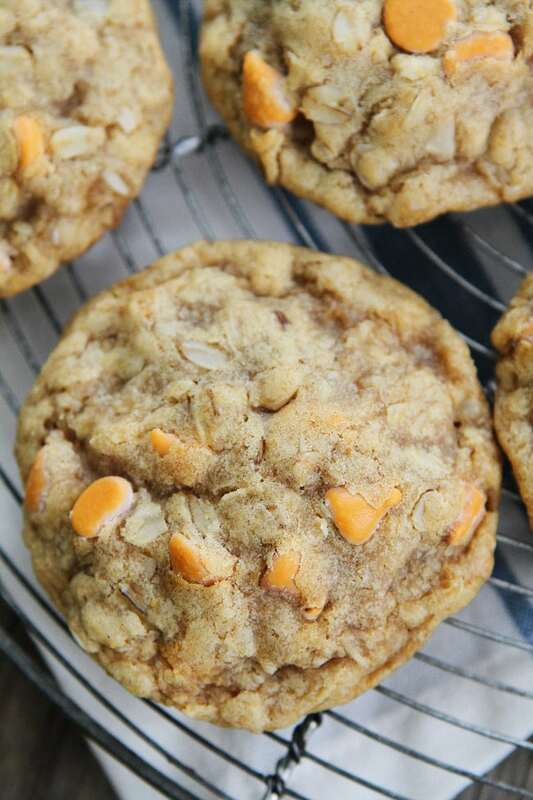 The cookies are soft, chewy, and have a wonderful nutty flavor thanks to the brown butter. The cookies are dotted with butterscotch chips, which I LOVE! 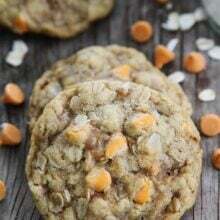 I am a huge butterscotch fan, always have been, but I especially love the butterscotch chips in these cookies because the brown butter and butterscotch combo is out of this world good! Almost too good, I can never stop eating these cookies. I think I ate three on the plane. I couldn’t stop myself! Make a batch and you will understand why. 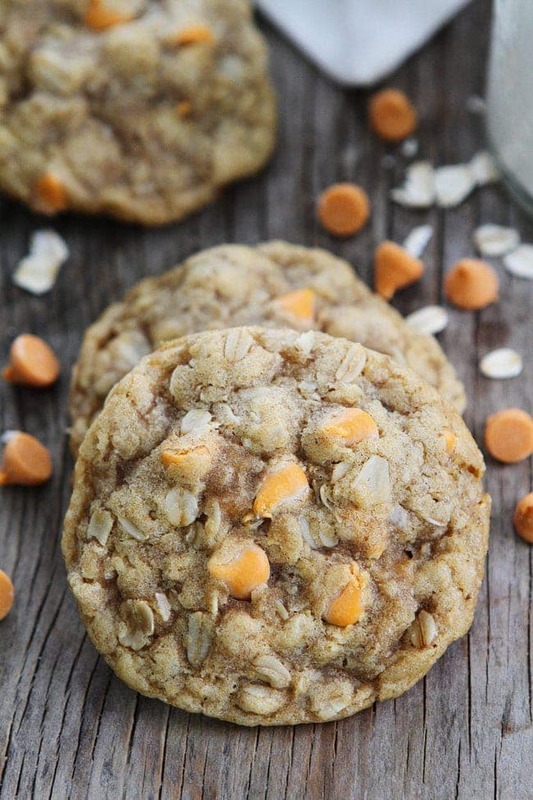 The next time you need a cookie fix, make my Brown Butter Butterscotch Oatmeal cookies. They are insanely delicious and one of my favorite oatmeal cookies! 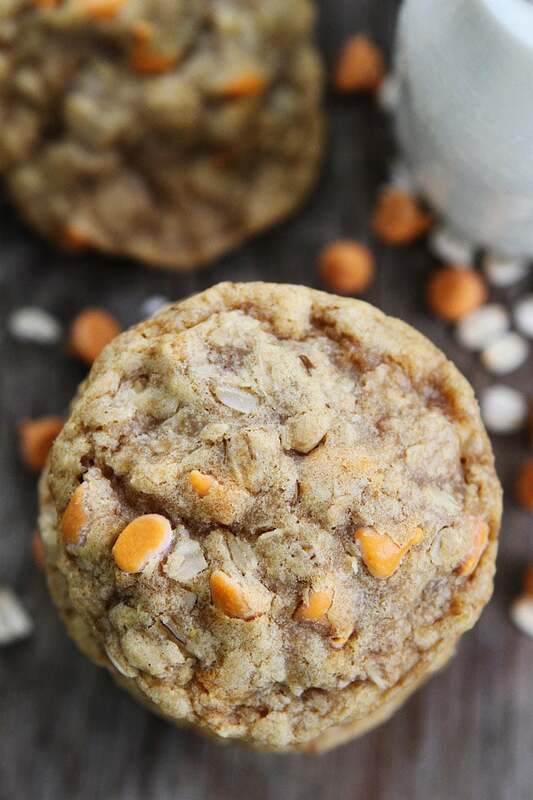 The brown butter makes these oatmeal cookies extra tasty! They are my favorite! Preheat oven to 350 degrees F. Line two baking sheets with Silpat baking mats or parchment paper and set aside. Cut the butter into tablespoons. Place in a medium skillet. Melt the butter over medium heat, swirling it in the pan occasionally. The butter will foam and pop, so be careful. Continue to swirl the pan often. Remove pan from heat once the butter starts to brown and smells nutty. There will be small brown bits on the bottom. The butter should be an amber color. Pour butter into a small bowl and cool to room temperature, about 20 minutes. While the brown butter is cooling, whisk together the flour, baking soda, salt, and cinnamon in a medium bowl. Set aside. In the bowl of a stand mixer, combine the browned butter with brown sugar and granulated sugar. Beat until creamy and smooth, about 3-4 minutes. Add the eggs and vanilla extract and mix until combined. Turn the mixer to low speed and slowly mix in the dry ingredients. Mix until just combined. Stir in the oats and butterscotch chips. Form cookie dough into 2 tablespoon sized cookie dough balls. Place on prepared baking sheets, about 2 inches apart. Sprinkle with sea salt, if using. Bake cookies for 8-10 minutes or until slightly brown around the edges. Remove from oven and allow the cookies to cool on the baking sheet for 2-3 minutes. Transfer to a wire cooling rack and cool completely. Note-store cookies in an air-tight container for 2-3 days on the counter. These cookies also freeze well. Send me a dozen, please! I can’t believe I’ve never baked with brown butter – I need to get on that! You have to! Sooooo good! Could these be made with gluten free flour? I haven’t tried it, but I am sure it would work! Enjoy! These cookies sound delicious. I might make a batch to bring to my get together later today. I laughed at your term “brown butter”. What you are actually making is called ghee, used in many Indian recipes. 🙂 Thanks for the recipe! hey Maria these are right up my alley! Yummy! Totally making these for my kids for their afternoon snack! OMG!! I love butterscotch chips! these looks so amazing! Brown butter is such a game changer! I want to make for my next flight! 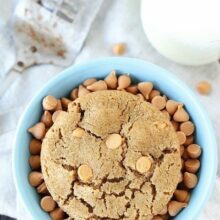 Brown butter and butterscotch chips – great combo! I recently started to bake with butterscotch chips again since it’s coming back into vogue and my kids are crazy for them! GIMME, GIMME, GIMME! These cookies look and sound so good! What kind of butterscotch chips do you like to use? I bought some recently that had a super weird medicinal taste?! LOL Your definition of “can never stop eating these” and mine are vastly different! This looks like an awesome recipe, thank you for posting it. I will try my best to stop at three in one sitting. Do you have another brand that you use? Great recipe! These perfectly match the oatmeal butterscotch squares that my mom used to make as a kid. I used Guittard chips as recommended. I also liked the greater proportion of oatmeal. That makes these cookies totally good for your, right? :-). Thanks for sharing! Try browned butter in chocolate chip cookies,its awesome! I wouldn’t make them any other way now. Is the measurement of 1 and 3/4 of a cup of butterscotchs chips correct? Seemed like way to many chips for the amount of batter! I made these tonight and oh my goodness, the browned butter is a game changer! My husband and I cannot get over the amazing flavors and the taste it leaves in your mouth! I bet you cannot eat just one! I made these tonight and they are PERFECT! Followed the recipe exactly and they came out giant, soft and delicious! Yay! Glad you liked the cookies! I need to make another batch! Funny little tidbit: I’m sitting at the table after lunch looking for a fruit leather recipe for my scrumptious peaches and found you! Started reading the recipe names at the bbottom of the blog, and my 13yo progresses from “Can I see?” to “Can we subscribe to this and eat from those meal plans?” And now it looks like I’ll be adding butterscotch chips to my shopping list because he HAS to try these cookies! Ha! You’ve got an 8th grade follower! Finally made these last night and WOW! Wowie wow wow!!! This browned butter is a game-changer! I’ve never actually come back to comment on a recipe before, but I had to for this one. So good. So ridiculously good. Love these cookies – have made them several times – I need to freeze them this time – any tips for freezing? Let cool completely and store in a container in the freezer. I like to eat them frozen, but you can let them defrost on the counter. I just tried this recipe but mine came out doughy and they did not spread much. They look so yummy! I’m going to make tomorrow!!! Will it be okay to use quick oats–or does it need to be other kind? I personally like old fashioned oats better, but quick oats will still work if that is what you have! Enjoy! Are these soft or crunchie cookies? 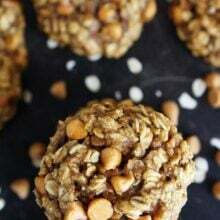 Made these without the butterscotch chips and they were just wonderful without them! The small bit of salt helps since the cookie itself is quite sweet (even without the chips).Very enjoyable! Love that they stay soft and chewy! Oh my goodness! I must try these. Such a great recipe! My new favorite. I’m a chocolate lover so I swapped in chocolate chips the second time around! I love these and have made them for many people who all loved them as well! I tried these ad they are amazing! However, mine did not flatten out and stayed round… was I supposed to flatten them out before putting in the oven? Any tips you have would be appreciated! I did follow the browning of butter but after tasting cookie I don’t believe that process adds much more or better flavor other than just melting the butter. Cookie was flavorful and held it’s shape when cooking. will try again. Does the butter have to cool completely before combining it with the sugar? 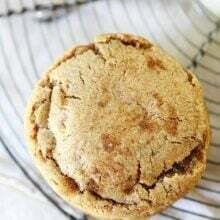 Oatmeal cookies are my favorite and I think this recipe is the best I’ve tried. The browned butter gives them such a delicious flavor. I’m throwing out my old recipes and making these from now on. Can I make the dough in advance and refrigerate it and bake the cookies the next day?